The Largest Butterfly In The U.S. And Canada Is The? The Creator Of What Product Was Cremated And Turned Into His Invention Upon Death? While the butterflies found in the U.S. and Canada will never rival the giant “birdwing” species found in tropical forests with wingspans the size of dinner plates, that doesn’t mean the two countries are devoid of unusually large butterflies. 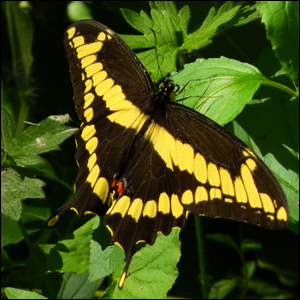 Giant swallowtails are common in parts of North America (the United States and Canada) and can even be found in Mexico, Central America, Colombia, Jamaica, and Cuba. The wingspan of giant swallowtails ranges from 3.9-6.3 inches (10-16 centimeters), giving them a “footprint” roughly the size of an adult’s hand. Unfortunately, giant swallowtails are considered quite a pest. The nickname for giant swallowtail caterpillars is “orange dog” (or orange puppy) because of the caterpillars’ destructive preference for citrus crops. Image courtesy of D. Gordon E. Robertson.